The Colorado Buffaloes (5-4, 2-4) were at a fork in the road. Nine weeks into the season, they had put themselves in the uncomfortable position of having no margin for error. The Buffs had a total of four wins, just two more needed for bowl eligibility. Yet, it seemed that getting to the six it requires might be a bit far-fetched considering their remaining schedule. Colorado entered their annual Homecoming weekend in desperate need of a win. The California Golden Bears (4-5, 1-5) posed the Buffs’ best chance for a win over their remaining four games. Amidst a tumultuous season for the unit, the offensive line finally held up long enough to give redshirt-sophomore quarterback Steven Montez time to throw in the pocket against Cal. It also helped that Montez was fresh off the first benching of his entire career and was focused in a way he had yet to show in 2017. The extra breathing room the front was able to provide CU’s offense was one of the main contributing factors to the Buffs’ success through the air against the Bears. After not completing a 50-yard pass all season, the Buffs had two in the first half. Montez had the time and opportunity to allow plays to develop and keep his eyes downfield. This was something we had not seen all year. 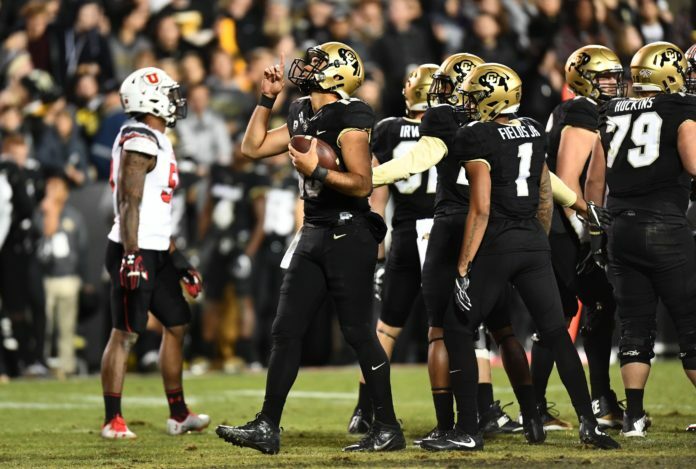 It was clear that the message that Head Coach Mike MacIntyre sent to both Montez and the whole team by benching his quarterback at halftime against the (#25/#25) Washington State Cougars (7-2, 4-2) the week prior was well-received. The Buffaloes finally put together four quarters of football in all three phases of the game and rolled to a 44-28 win, now 2-4 in conference play and one win from a second consecutive bowl game. It would be the first back-to-back postseason trips for the program since 2004-05. Their next chance of reaching the postseason, but more importantly, the next game on CU’s schedule is a matchup with the Arizona State Sun Devils (4-4, 3-2) on Saturday, November 4th in Tempe. Indications from MacIntyre all week have not been extremely clear regarding the status of his offensive line. 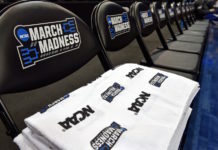 He said on Monday that redshirt-senior center Johnathan Huckins, who is recovering from a concussion, had to pass his final impact test and expected him to practice Tuesday. Then when asked on Wednesday, he gave a somewhat-vague answer that provided no specifics on Huckins’ status. MacIntyre, the eternal gamesman, is known for playing his cards close to the vest, especially when it comes to injuries. ASU Head Coach Todd Graham is known for his love of bringing defensive pressure and his use of blitzes. The Buffaloes are well aware of it; they have seen it many times before and have been preparing all week for it. We don’t know exactly who will be lining up for the Buffs up front on Saturday, but we do know one thing: Colorado now has seven guys at their disposal, when healthy, with more than enough experience under their belts to build off their performance last week. As MacIntyre said prior to the Homecoming game, the offensive line has seen just about every little thing that a defensive line could throw at them at this point. Every look, every “okie-doke,” they know what to expect. However, if Colorado wants to punch their bowl ticket, they will have to demonstrate that they can be consistent from week-to-week at protecting their quarterback. Montez completed 20 of his 26 passes for 347 yards and three touchdowns through the air. While also rushing for one touchdown, his 227.2 passer rating was a career-high. He was the same old Steven this week – charismatic, jovial and magnetic – but there was a slight difference. He was focused. MacIntyre said after the Cal game that he “always knew Steven was a confident kid, but now I know he’s not cocky.” On Wednesday, Montez took his offensive line out to dinner at Pei-Wei in Boulder. A bold move considering he’s operating on a student-athlete’s weekly budget, but he didn’t care, they deserved it. They were the key that unlocked the Colorado Buffaloes, and they were to be rewarded as such. As we all know, getting a good meal in college is like finding gold. 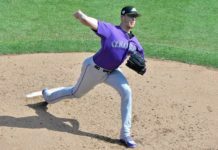 The Buffaloes became the offense that we expected to see at the outset in 2017. Redshirt-senior wide receiver Shay Fields finally broke out of a long drought, registering his first 100 yard receiving game in seven weeks, adding a big touchdown in the process. CU was also extremely effective rushing the ball. Redshirt-senior tailback Phil Lindsay had 33 carries for 161 yards. They were dynamic. They were exciting again. Above all else, they weren’t predictable. 1-0. That’s the only record the Buffs care about at this point. They are 1-0 in “gold games.” They have to go 1-0 this week. They are 1 win from a bowl game. When I look back on the 2016 season, you want to know what the first thing that comes to mind for me is? The 4-0 record over the last month of the season that culminated with a Pac-12 South crown. I remember the ugly win against a UCLA Bruins team – the first time Colorado beat UCLA since joining the Pac-12. I remember the defense digging their heels in the ground and carrying the team the final two games of the season. I remember junior safety Nick Fisher’s tackle on fourth and one in the red zone that sealed the victory over Washington State. I remember walking down the stairs from the press box after the Buffs did the unthinkable and secured a berth in the Pac-12 Championship game. I remember looking out onto Folsom Field and seeing a sea of people. Those are memories that are so clear it feels like they were just yesterday. That team left a legacy. For the first time all season, I saw the Buffs remember all that too. Shay Fields said after the win last weekend that he wasn’t sure why the Buffs had a renewed sense of urgency, but it didn’t matter, they had it now. All week in practice, I received nothing but confirmation that this is true. Actions speak louder than words, on and off the field, Colorado is dialed in. It reminds me of the beginning of 2016 when the team said, “our goal is to be Pac-12 Champions”. We all rolled our eyes. The last two weeks, all I have heard from this team is, “our goal is to win the next four games”, not just make a bowl game. I am not rolling my eyes this time. The proper mentality and approach is just a part of the equation. To do something special, you have to go out and make it happen, put your stamp on it. Time goes on, people come and go, things change, and those who fail fade into the background until one day, they are nothing more than a distant memory. A legacy doesn’t come easy. If it did, everyone would have one. The 2017 Colorado Buffaloes now have a chance to write their own as the calendar has flipped to the final month of the regular season. It requires hard work, dedication and the mental fortitude to focus at the highest level from play to play, day to day and from week to week. Arizona State will be seeking revenge after the 40-16 drubbing they took in Boulder last year. To win, Colorado has to embrace their newfound momentum, roll into Tempe with a big chip on their shoulder, and look to prove a point. It’s not how you start, it’s how you finish. If the Buffs pull through and go on a run this month, we will look back on the season and first think about where they ended, not where they began. After all, they will remember. They remember what you do in November.